Here is one I did for fun of Mini's new electric car. 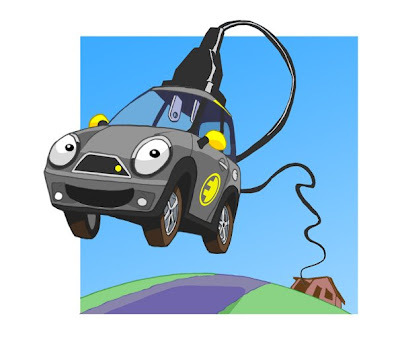 There are quite a few alternative fuel vehicles being developed these days, but I really believe the electric car the future. I think we need to learn to let go of the antiquated internal combustion engine. The electric car is still in its infancy, but once it gets popular enough to be profitable we will see great advances in battery technology, which will drive down the cost as well as increase efficiency and reliability. The great thing I'm seeing now is sporty electric cars, which I'm very happy about. The only way I could give up my SVT would be for something like this Mini E. It's my dream that my next auto purchase will be electric powered. Check out this video from Jay Leno's garage. He has a great website full of videos of his personal car collection as well as new cars, which he gives good reviews and opinions. He is very interested in electric cars and he's got plenty of videos on those too. I really like your cartoony style man! Need more in my life!